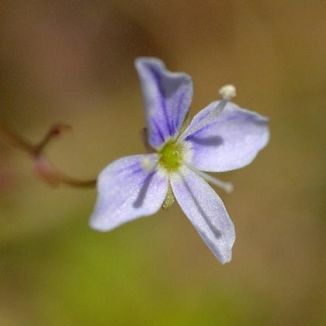 Marsh Speedwell is not easily confused with other wild plants on this web site. 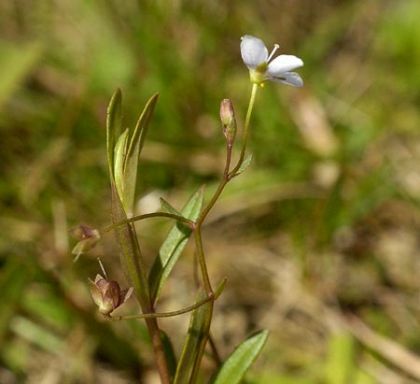 Growing mainly on boggy, damp, acid ground, this is a delicate perennial which creeps on weak stems, rising to 20cm tall, bearing pale blue flowers in racemes in opposite pairs from June to August. The flowers (6-7mm across) are 4-lobed with dark lines, the calyx-lobes shorter than the corolla. The long leaves (15-40mm) are opposite, linear-lanceolate, without stalks and sometimes tinged red. This is a native wildflower which belongs to the family Plantaginaceae. I first identified this flower in Roundwood, Co Wicklow in 1976 and photographed it near Tullycanna, Co Wexford in 2007.